Okay this was made from the tiniest image I have ever worked with: >>Click<<. And it was hell. Literally. Anyways I vectored Nausicaa and this was the only easy thing to make in the whole wallie. After finishing the whole thing I proudly showed it to abul who happily showed me a bigger version of the scan (but it was darker than this on and the flowers were simply black so overall I'm happy I used this). At that time I was simply frustrated that I hadn't looked more thoroughly for a better quality scan... nonetheless I used it as a reference pic and fixed some little things here and there and added some more detailing to the bg. sidenote: umm... In my personal ghibli scale Nausicaa is the best Miyazaki work ever. Hope you like it - critique is very much appreciated. Btw did you painted it using a mouse? the background is really amazing! I like all those details of the flowers and plants. i like the shadows on the bg as well. very beautifully done again! great expression and pose of the character. great work! I haven't watched any Ghibli films in a while, I certainly miss them. A beautiful wallpaper for a beautiful film. Great work! Dude, this is AMAZING. I've tried to vector from scans that small and have given up VERY quickly. The bg is beautiful and I like that you maintained the separation between Nausicaa and the bg. Great work. That image is really tiny, I couldn't stand vectoring of something this small. The fact that it's vectored of such a small image makes your wall more awesome somehow XD. 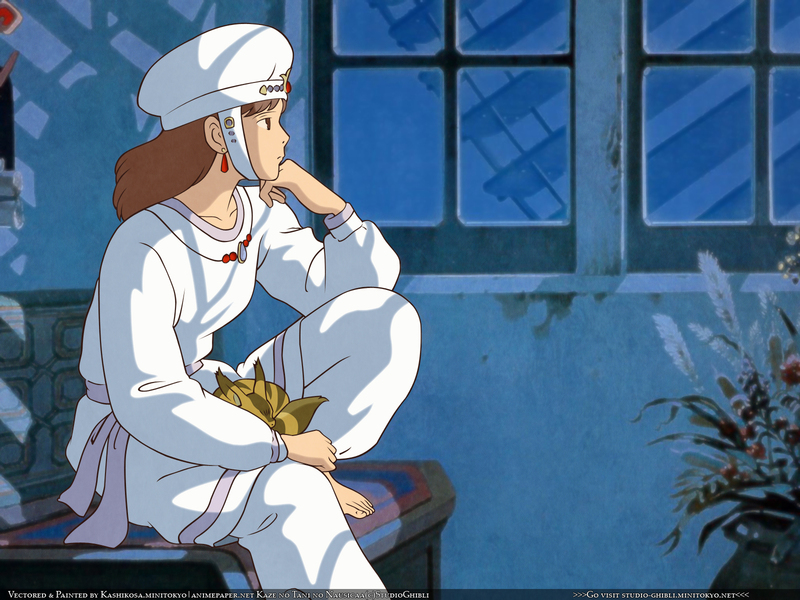 Great vector of Nausicaa and the background is great, the vase and flowers are so pretty I wish I could see more of them in the wall.